The controversial new film My Name is A by Anonymous is finally being released on DVD September 23rd by the independant horror studio Wild Eye Releasing. Inspired by real events My Name is A by Anonymous depicts the brutal crime committed against an innocent youth by 4 seemingly average girls. Katie Marsh stars as Alyssa, or A. She is brilliant as the ringleader of this disaffected group of girls. Alyssa’s sidekick is played by Demi Baumann whose performance is subtle yet chilling. International pop sensation Teona Dolnikova plays the singer whose melancholy broodiness, and haunting voice takes the film to a surreal place. The Angst is played by Alex Damiano. Her performance will force the the audience to go along with her on an emotional and tragic journey throughout the film. The four depictions converge into one act of brutality that is portrayed without sympathy or any justification. It will leave the audience breathless. My Name is A by Anonymous was directed by the infamous controversial film director Shane Ryan. His films have been compared to Gummo, and Kids. His style of film making takes a page out of Cassavetes playbook by having the actors work their way through a scene rather than throw words out there that were previously written down. His films are loved and hated by an equal number of critics proving that Shane Ryan’s voice speaks louder than most filmmakers in the industry today. His latest film, My Name is A by Anonymous keeps his cinema Verite style but then Ryan mixes fantasy, reality, fiction, speculation, and personal beliefs to create a film unlike anything you have seen before. The film is available now for pre-sale through most retailers including Barnes and Noble, Frys, Best Buy, and Amazon. Go to Mad Sin Cinema to pick up an autographed copy of the DVD signed by the director Shane Ryan. 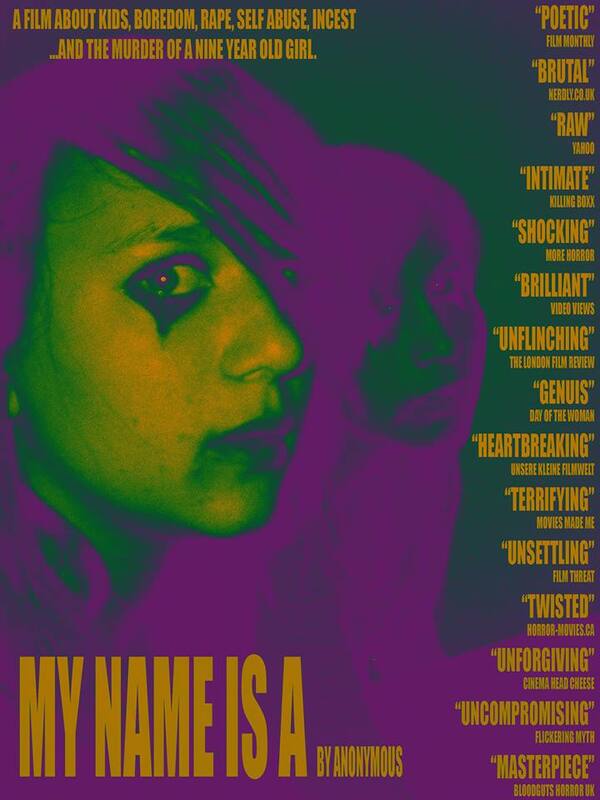 Wild Eye Releasing will release the film on VOD, and PPV under the alternative title Alyssa:Portrait of a Teen Killer. If you can’t wait for the film to come out on DVD, or VOD, My Name is A by Anonymous is available to rent now online through vimeo. To celebrate the release of the film Bzzzline Entertainment and Mad Sin Cinema are holding a premiere of My Name is A by Anonymous on September 25th. It will be at The Complex Theater off of Santa Monica Blvd. in Hollywood. Click here for facebook invite for more details. Click here to purchase tickets to the premiere of Shane Ryan’s latest creation. To follow all of the happenings with My Name is A, click here for their facebook page. For all things Shane Ryan Click here. To keep up with the Fangrlzzz Blog as well as Bzzzline entertainment click here.